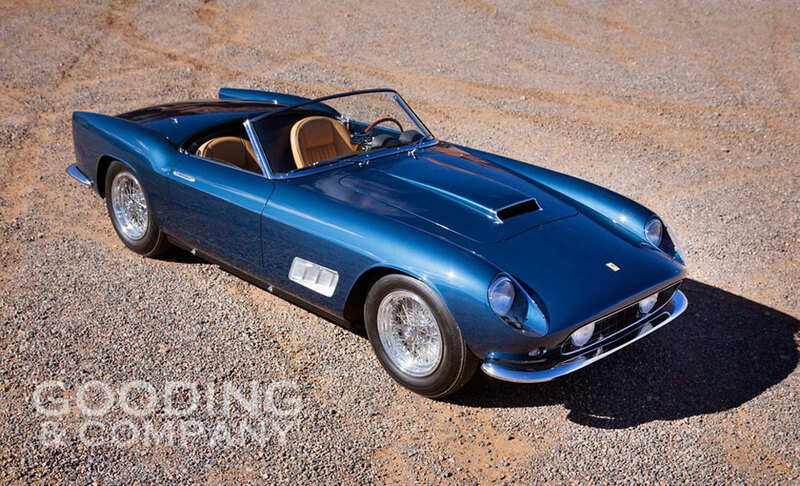 Gooding & Company, the auction house acclaimed for selling the world’s most significant and valuable collector cars, is delighted to announce the following offerings for its 2013 Scottsdale Auctions on January 18 and 19: a blue chip 1958 Ferrari 250 GT LWB California Spider, highly-original 1959 Porsche RSK, one-off 1958 Ferrari 250 GT Coupe Speciale by Pinin Farina and Edsel Ford’s personal 1930 Ford Model A Sport Phaeton. The preview and auctions will be held at Scottsdale Fashion Square, the luxury shopping destination conveniently located in the heart of beautiful Scottsdale, Arizona. These four exceptional collector cars will join a wide variety of collectibles, such as the 1957 Maserati 150 GT Spider prototype, 1957 Mercedes-Benz 300 SL Roadster and 2003 Ferrari Enzo, to round out Gooding & Company’s robust catalogue that will be offered over two auction days during the annual Arizona automotive auction week. 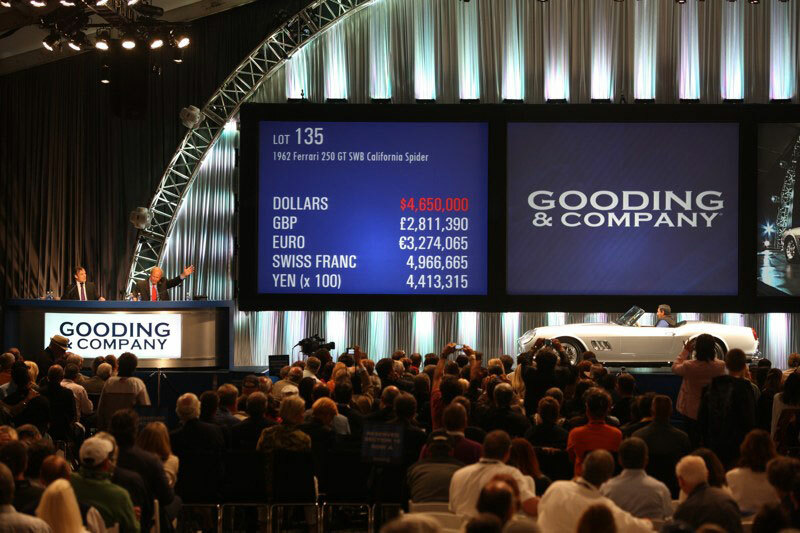 At last year’s Scottsdale Auctions, Gooding & Company sold 116 out of 118 cars realizing $39.8 million in gross sales with 98% sold and 13 world records. An early Scaglietti-coachbuilt example of one of Ferrari’s most iconic open sports cars, this extraordinary, matching-numbers California Spider is the 13th of 50 built and features coachwork with rare, covered headlights. The car was delivered new to Ferrari Representatives of California and has been cared for by only three owners in the past four decades. Following its spectacular and complete restoration by Dennison International in 2012, this car received tremendous praise and near-perfect scores at both the Pebble Beach Concours d’Elegance and Ferrari Club of America Meet, where it took home a Platinum trophy. Most importantly, this rare Ferrari was certified by the Ferrari Classiche department, confirming it as an authentic, matching-numbers example. Dazzling in metallic midnight blue over rich, tan leather interior, this California Spider’s estimate is $5,500,000 – $7,000,000. One of Porsche’s most significant and beautifully-designed, open race cars, the RSK evolved from the marque’s highly-successful 550 Spyder series. The RSK racing program served Porsche well in the late 1950s, repeatedly seizing class wins at Le Mans, Targa Florio, and the European Hill Climb Championship. One of 37 built, this RSK was delivered new to the Miami-based sports car enthusiast Roy Schechter, who first raced the car that same year in Cuba at the 4 Hours of Alamar where it finished in fourth place. From that point on, this extraordinary, privateer racer was positioned for greatness. At the Courtland Sports Car Races, Schechter and his RSK took home a significant overall win, beating both Jim Hall’s Maserati 450 S and E.D. Martin’s Ferrari Monza. Soon after, the RSK participated in the Nassau Speed Week in the Bahamas, racing in the Governor’s Trophy, Porsche Trophy and the Nassau Trophy. Since its retirement in 1960, it has been restored and inspected by Porsche Historian Jürgen Barth, who appreciated its rare, overall originality, early racing history, and matching-numbers engine. A rarity indeed, the RSK’s estimate is $2,800,000 – $3,200,000. Formerly part of the sensational Greg Garrison collection, this one-off Ferrari is one of the most significant one-off 250 GTs by Pinin Farina. This car debuted at the Geneva Motor Show in 1959 and was positioned near a 410 Superamerica coupe as well as two standard 250 GTs, a telling display that showcased Pinin Farina’s innovative blend of design cues from both models to create this 250 GT Coupe Speciale. Clear design details that make this car unique from a standard Pinin Farina Coupe include a large wraparound rear window with rear quarter windows, slim pillars, and body flanks creating elegant lines running from the front to rear wheels. 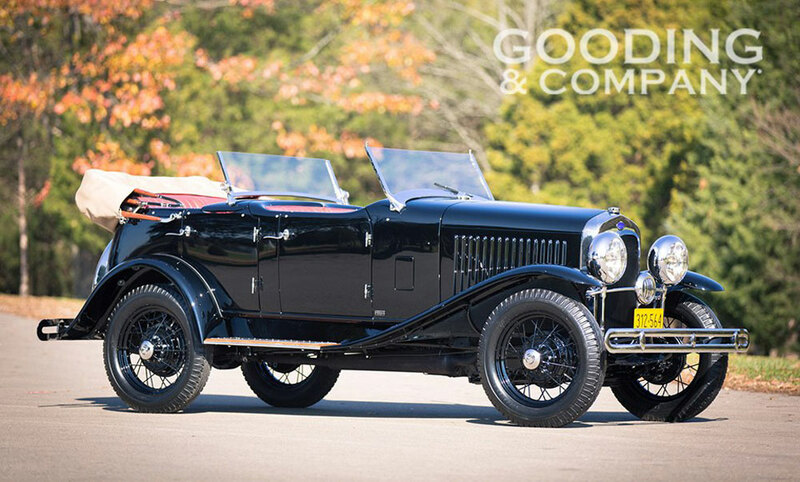 Recently restored by noted marque expert Bob Smith Coachworks, this one-off show car has won major awards at Pebble Beach and Cavallino Classic. 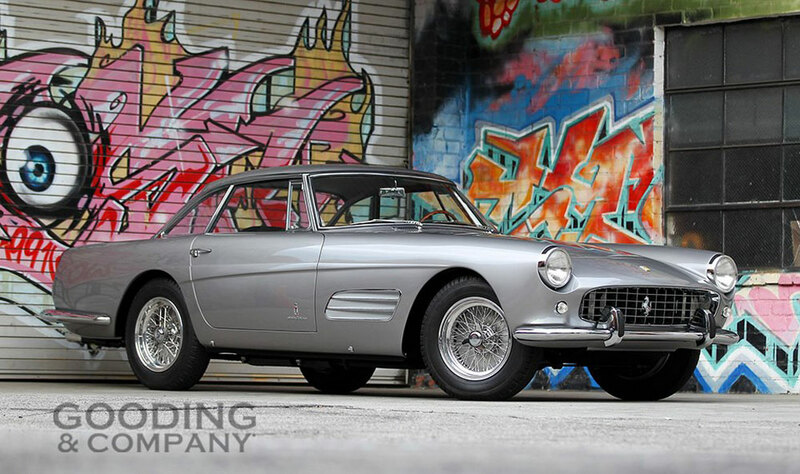 With beautiful and sporting style in metallic silver over black leather interior, this one-of-a-kind Ferrari is an important piece of Ferrari’s design history and an ideal Concours entrant. Its estimate is $1,700,000 – $2,100,000. A true connoisseur, Edsel Ford may be best remembered for his influential vision of bringing continental art and design to American automotive manufacturing. In 1929, as President of Ford Motor Company, he commissioned LeBaron to design a one-of-a-kind body for the new Model A chassis, an experimental project that married the mass-produced Ford car to bespoke style and luxury. This resulted in one of the most attractive, pre-war Fords ever made: a one-off luxurious custom and elegantly-sculptured dual-cowl sport phaeton for Edsel’s personal use and taste. The car’s extraordinary specifications include exclusive, French Stephen Grebel headlamps, a center-mounted Klaxon horn, exposed chrome detailing, and patent leather splash aprons. In the 1950s, this car was sold to the well-known antique car collector Vernon Jarvis, who stored it in an Illinois dairy barn where it remained for more than 50 years. The car was discovered surprisingly in the dilapidated barn in 2007 and has since been restored to the highest concours standards. Edsel Ford’s spectacular, LeBaron-bodied, bespoke Model A will make its first public appearance since restoration at the Scottsdale Auctions in January and will be offered with an extensive file of original documentation, photography, period magazine articles and Edsel’s Michigan registration. Its estimate is $325,000 – $400,000.